Hardly any anti-Semites nowadays admit they hate Jews. The accepted guise for Judeophobes is to claim that they harbor no ill-will toward Jews and that they are merely anti-Zionist or oppose given Israeli policies. Yet on occasion their words and actions offer a glimpse into the sinister darkness behind the cynical politically-correct façade. 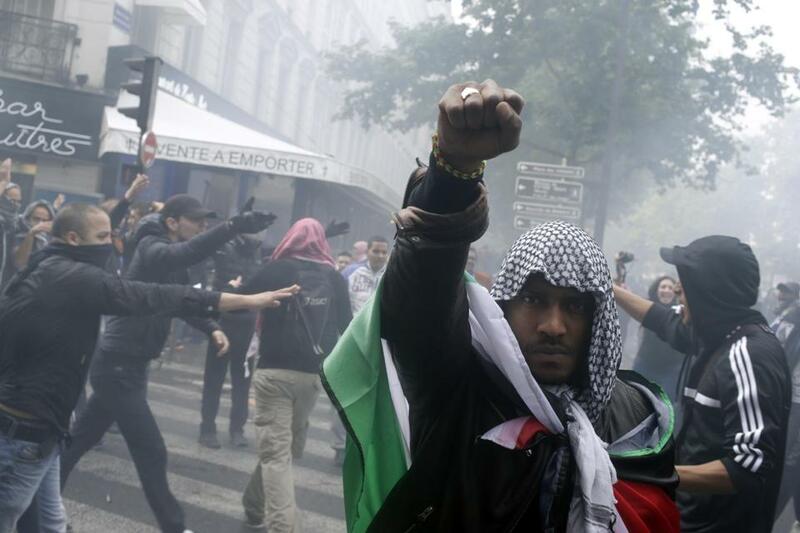 So it was last Sunday in Paris during a demonstration against Israel’s Operation Protective Edge. Some of the marchers broke off and made a beeline for two centrally located Paris synagogues. The worst incident occurred at the Don Isaac Abravanel Synagogue on the Rue de la Roquette (in the heavily Jewish 11th arrondissement of Paris). A mob donning keffiahs, waving jihadist flags and wielding clubs (and chairs grabbed from nearby sidewalk cafes), converged on the synagogue, attempted to storm the building and attack the worshippers trapped inside. They were thwarted by police and Jewish security volunteers. Injuries were reported both among the Jewish defenders and the officers. Many witnesses reported that the attackers chanted “death to the Jews” in French, along with the Arabic Itbach el-Yahud (slaughter the Jews). The siege on the synagogue lasted for well over an hour, during which time the congregants couldn’t extract themselves. Indeed this was precisely the classic modus operandi of old-school anti-Semites who felt no compulsion to pretend they were anything but Jew-haters. For them any trumped-up excuse sufficed to blame all Jews anywhere collectively and the issue of any actual culpability – individual or otherwise – never entered into it. If all the Parisian demonstrators wanted was to “free Palestine” (without even going into the merit of their incitement on that front), what business have they to attempt to beat up Jews who are quite clearly out of Palestine? This is the touchstone of irrefutable racism. The Sunday synagogue attacks weren’t the first instigation to violence against Jews under the cover of protesting Israel’s current campaign in Gaza. Near a synagogue in the Belleville suburb of Paris, a demonstration Saturday featured the same hoarse shouts of “slaughter the Jews,” and “death to the Jews.” One day earlier a firebomb was hurled at another synagogue, this one at Aulnay-sous-Bois, a northeastern suburb of the French capital. The Paris synagogues or Paris Jews targeted cannot be held liable for Israeli actions, not that Israeli self-defense need altogether be regarded as villainous. Attacking them is every bit as racist as is wholesale rocketing of Israeli civilians; as was as was the abduction, torture and eventual murder by fire of Ilan Halimi in 2006; as was the shooting of a Jewish teacher, his two toddler sons and a small Jewish girl at the Jewish school in Toulouse two years ago; or as was the shooting at the Jewish museum in Brussels just recently. The shame of it is that this might not be an entirely out-of-favor viewpoint. It will lurk behind official denunciations of anti-Semitism and it will thrive as long as the world refuses to recognize the Arab war against Israel as often being a war against all Jews wherever they are. As a matter of fact, the Jews have always been badly accused for different reasons absolutely unfounded and contradicting reality. For instance, killing Gentile children in order to use their blood in the baking of Matzoth! I believe that the reason is simply Jealousy. Antisemites do envy us! because we survive millennia, because we receive so many Nobel Prizes, etc. Of course, they would deny to hate us, as any jealous person would, first and strongly, deny to be jealous! Doesn’t it make sense? The old cinema intermission advert transmogrified to read “coming to a town near you soon” comes to mind. From the pen by Father Niemoller – “First it was the Jews” – etc, seems appropriate. “Never Again”? It never ends. Bending the “Power corrupts” proverb: People lie; weak people lie incessantly. Why? For the weak, allies are indispensable. So when you have a country the size of New Jersey versus a numerous but powerless Muslim opposition, you simply can’t believe anyone. You can just have a side. This is the perfect example. At Mondoweiss, an antizionist site comparable to the people she describes in the first paragraph, there is a description of the same event, “Violence outside Paris synagogue falsely attributed to anti-Semitism”, with the exact opposite conclusion. I think it’s instructive to read it, especially the comments. Half are Jewish. While I expect lying, I must admit I don’t expect it for the enemy. Finally, and largely off-topic, I read, “Thus, for example, French Ecologist Party…” – Green is the color of Islam too. Those incidents are most disgusting and clear reminders of the ongoing virulence of worldwide Antisemitism. A few weeks ago, there had been an anti-Nazi demo organised by antimilitaristic leftists in the German town of Bad Reichenhall. I joined in and “tested” the leftists by wearing an IDF T-shirt. Let me see…weren’t there anti-Semitic riots in France in 1894, around the time of the Dreyfus case? This was long before the world had ever heard of the PLO. The rioters weren’t upset at Operation Protective Edge, for sure. What motivated them, I wonder? Jews were massacred in France (and not only France of course) in the late Middle Ages/early Renaissance period, blamed for the Black Plague, they were burned alive, men, women, children and babies. So many Jews fled France as a result, there was a mass exodus eastward. According to Leftist logic, Israel is to blame. The medieval French were inspired in their Jew-hate rage by Jews building homes somewhere in East Jerusalem or Beit Shemesh or Ariel in the twenty-first century, a time-travelling French reporter managed to go back to the 14th century (using Dr Who’s telephone booth thing), told the people of Toulon and Strasbourg what these Jews in the twenty-first century were up to (building homes!) and this set off their rage and got them to burn alive all those Jews. This scenario is no less logical than all the others, that justify the most extreme anti-Semitism. Seems Europe, as well as Obama, are beginning to wake up under flash of burning flags- Americans and Israelis!- , as the b veiled shapes with dark clothing are washing streets of Europe, wave by wave burning tires, books….and soon peoplle who do not follow Koran… is it too late to save the world? but meanwhile, Israel, a tine brave state, is the only one to stand strong fighting for freedom and against the bully and Tyranny of Muslims….as the world is watching….